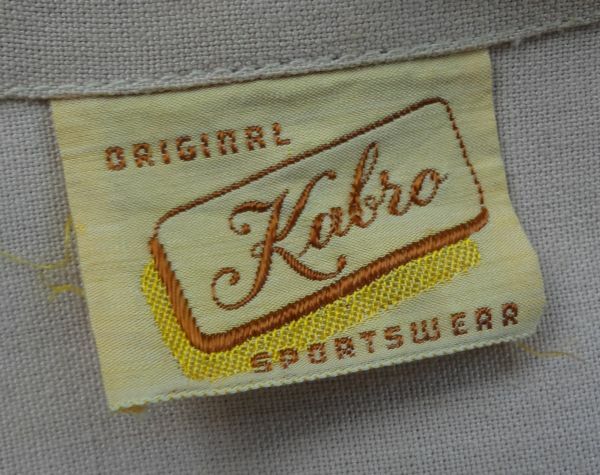 A couple of months ago I went on a rant about using the correct terminology when describing vintage and antique garments. 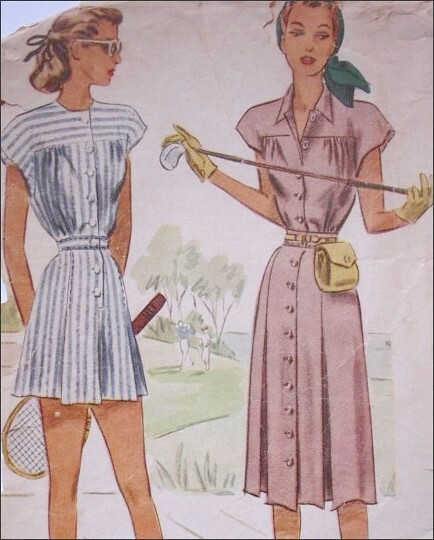 Not everyone agreed with me, and I can see why, but because I used playsuit as an example, I’m been looking at lots of images, especially in 1930s and 1940s ads, to make sure playsuit was the proper term. And it is. The one-piece shorts and top combination above is most commonly referred to as a playsuit in ads of the period. Almost all the ads I found, and there were quite a few, also featured a matching skirt which can be worn over the playsuit. 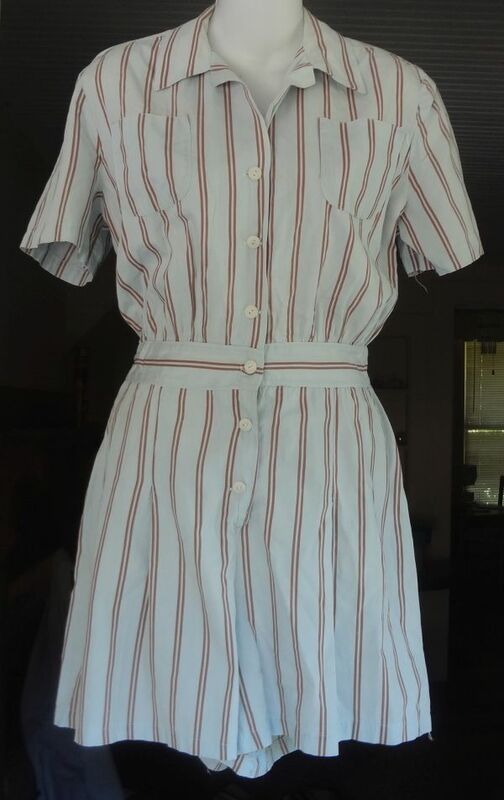 On my recent trip to the Hillsville Flea Market, I pulled the playsuit out of a big pile of vintage garments. The first thought through my head was, “If only the skirt was here too.” It was my lucky day, as the skirt soon emerged from the heap. 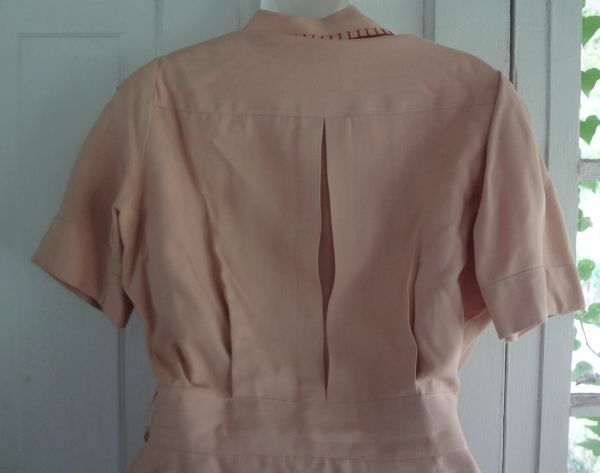 In most of the ads, the skirt buttons up the front, but in my new example, there is a metal zipper closure. There is also a label in the skirt, something I did not notice until I got the set home and started a better examination. I was a bit surprised by the label, as I’d known Jane Irwill only as a sweater maker. The company was actually called Irwill Knitwear Corporation. 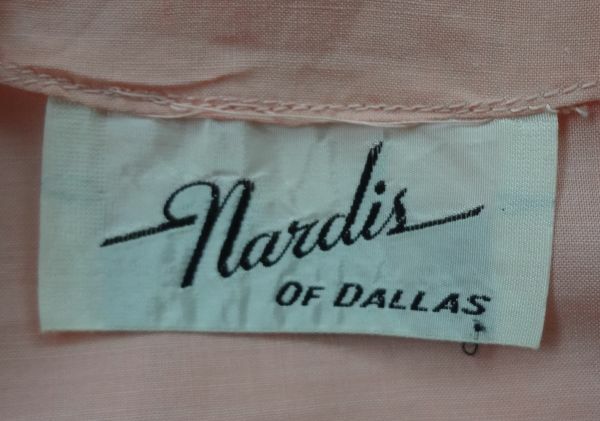 But a label is an excellent starting place in trying to learn more about a garment. The first place I turned to was TESS, the US trademark site. TESS is a great starting point, because it often gives the name of the owner of the label, and it always has the name of the company that produces it. In this case, I learned that Jane Irwill was a maker of sweaters and playsuits, and that the company name was Irwill Knitwear Corporation. The page also states that “Jane Irwill” is not a real person. 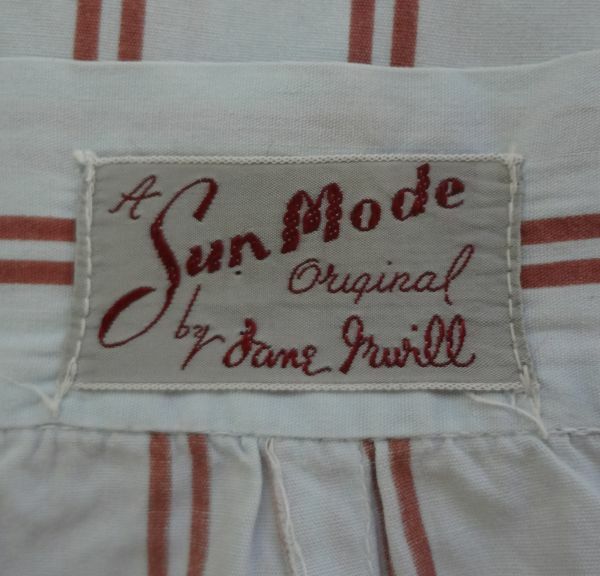 According to TESS, The trademark “Jane Irwill” was first used in 1940. I always take first usage dates on TESS with a grain of salt, as I’ve found many errors over the years. Often the trademark application is made many years after the first usage, and people being human, make mistakes. So I really do not give the 1940 date much credence. My next step was to see what I could find out about the Irwill Knitwear Corporation. Quite a few sites that list business registrations list the year of incorporation as 1923. The founder of the company was Irving Louis. Just because the Irwill Knitting Corporation started in 1923, we cannot assume that the Jane Irwill label dates back that far. The first actual reference I found to the label was in 1939, in a business directory. I also did a search for “Sun Modes Jane Irwill”, and came up with several newspaper ads ranging from 1946 through 1954. It could have been used earlier, or later, as I only located five examples. So depending on when the label was really first used, I’m looking at a set that could have been made between about 1935 when play sets became very popular, through the very early 1950s when the style changed to a more fashionable line. This was a basic sportswear design that did not really change much in those years. So it is necessary to really look at the details to narrow down a date. Note how long the skirt is. Add two inches to that length because the skirt was hemmed at some point. This means that either the wearer was short, or the skirt was shortened to bring it more into style when skirts got shorter during WWII. 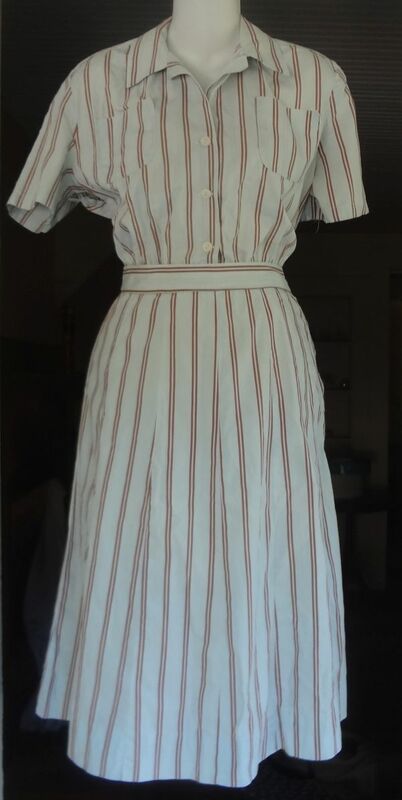 The skirt length, plus the relatively weak shoulders tend to suggest that this set is either before 1939 or so, or after 1947. Another clue is that the skirt is cut in eight gores rather than in a front and back cut as two pieces. This uses more fabric, and is another clue that this set was not made during the war. The next thing I considered was the fabric design and the colors used. 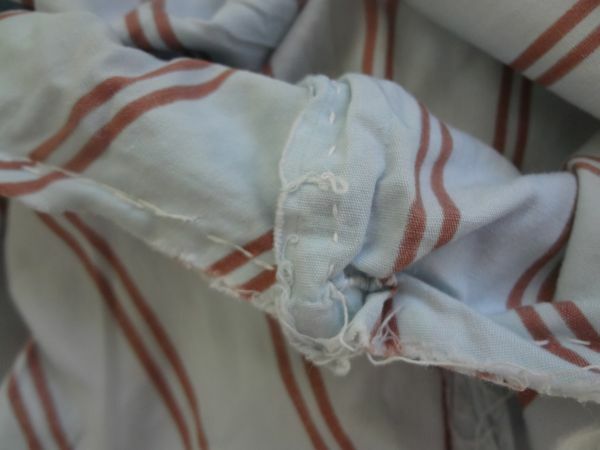 The fabric is a very light blue with a brown stripe. Some people I know are very good at identifying the possible years of manufacture just from the colors used. Unfortunately, I am not one of those persons, so without a lot of reading and looking at period examples, that information does not help. What about the stripes, though? In looking at magazines from 1934 through 1950, I noticed the popularity of stripes increased around 1940, and they stayed popular throughout the 1940s. So, my best guess is that my Sun Modes set dates to around 1947 or 48. I would appreciate any additional insights. This was a great addition to my collection. In collecting I’ve noticed that the playsuit is often found for sale, but it is rarer for the skirt to be present as well. I already had one set that is most likely early 1940s. 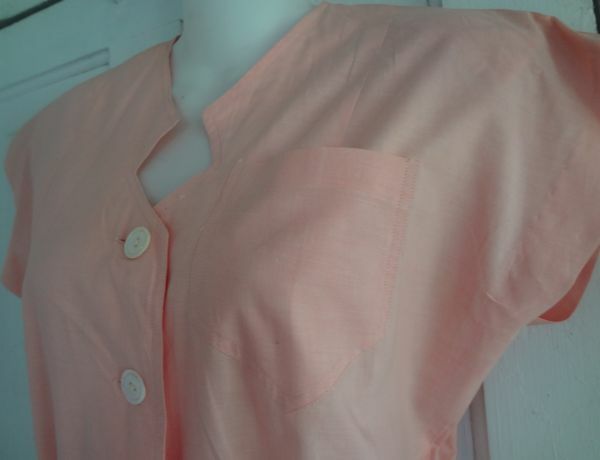 It was home sewn using feedsack material, a good example of WWII era thrift. It’s nice to now have a later example. Let me add a few words about condition. This set was quite dirty, so I did hand wash it with great success. 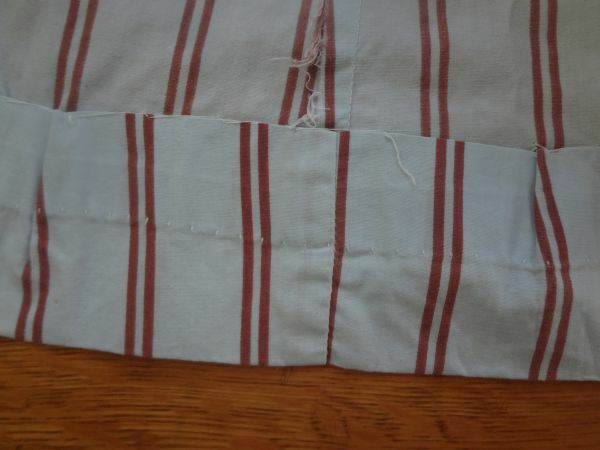 Besides the hemming, there are some crude hand repairs to the sleeves and underarms. For now I’ll leave them as they are. I rather like the evidence of the former owner’s hand. I recently ran across this skirt and a pair of matching shorts, and I bought them even though there are quite a few problems with the two pieces. To be really honest, I wanted these partly because of the issues and my desire to analyze the set. Using the questions from The Dress Detective, I wanted to hear the story these pieces have to tell. To start with, there is a real possibility that a piece is missing. 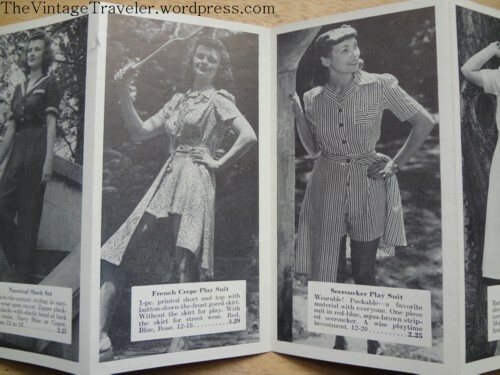 By looking at sewing patterns and catalogs from 1940 through the 1950s, these sets often came with a matching blouse. 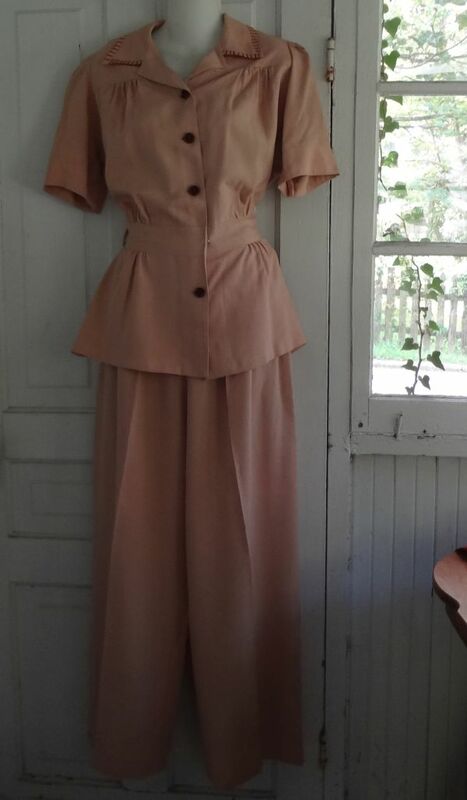 These pieces are home sewn, and there is no way to know if a matching blouse was actually made, but that is the way the pieces were marketed, and presumably, worn. Here are some good examples from a 1940s brochure from Edwards Department Store in Rochester, New York. In these photos the top and shorts are attached as one piece, but these were also available as shorts and top separately. After World War II ended, fabrics became a lot more colorful. Dyes had been restricted during the war, and I’m sure people were ready for a burst of color. If you look at fashion magazines starting as early as the middle of 1945, you can really see what I mean. Interesting designs and color combinations dominated. In the case of my skirt and shorts you can see turquoise, a chartreuse-y yellow, and two shades of rust, printed on white and accented with black. As mentioned, the set is home sewn, using simple techniques. The sewer must have had one of those new-fangled buttonholers that attached to the machine. 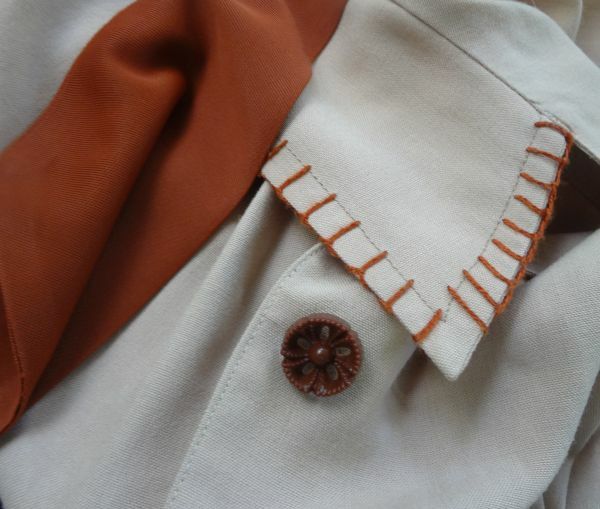 The buttons on the skirt are mother of pearl, and they are well-worn. They seem to be a bit old-fashioned for the piece. Could they have been re-cycled? There is a noticeable color difference between the shorts and the skirt. The skirt looks hardly worn, but the shorts are quite faded. What does that say? The shorts were obviously washed more than the skirt, and so we can assume they were worn more. There is another interesting clue on the shorts, a smear of dried paint. Could it be that after the shorts became either worn or not so fashionable (or both) that they were used to wear around the house for chores like painting. It points to a long life of the shorts and skirt, and possibly a blouse, moving from cute outfit to work attire. There is one last thing to point out. At sometime the skirt was shortened as evidenced by the faded line. During the last part of the 1950s skirt hems did rise, and so this could have been an attempt to make the skirt more fashionable. Or it is possible this was done years later by a wearer of vintage clothing. Either way, it is an interesting part of the skirt’s history. 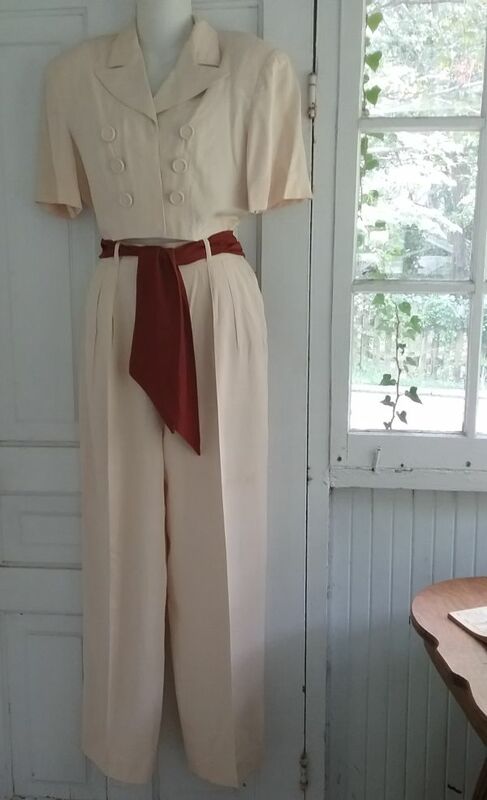 I guess it wasn’t enough that I have a “new” 1865 exercise dress, and a 1915 gymsuit, I also have a new 1940s one, thanks to my good friend Amanda, who resides in Vermont. She actually got this at a clothing swap, which sounds like my kind of event! It came in the mail a few days ago, and now that I have it, I’m not 100% sure it was used as a gymsuit. It’s the wealth of details that are throwing me off: the two buttoned pockets, the little belt flaps, and something you can’t see – sewn in shoulder pads. It’s possible it was made as a playsuit, and I’m fairly certain there was once a matching skirt. There are snaps on the back of the waistband for attaching it. So it could go either way. And to be honest, this irritates me just a tad. Speaking from personal experience, a gymsuit should be anything BUT cute and stylish. When I started junior high in 1967, we were required to buy a gymsuit. Unfortunately, they were stark white and made from a cheap cotton fabric. They were the ugliest garments any of us had ever seen, and now we were forced to wear them three days a week. The girls who were tall and tan looked pretty good in them, but I was neither. And as we aged, the gymsuit did not change. Some of the girls took advantage of this by continuing to wear their suit long after they had outgrown it. I had no such luck, having reached my adult height at age 12. So why was it that girls in 1940 got to wear a sweet little number like my new yellow suit? 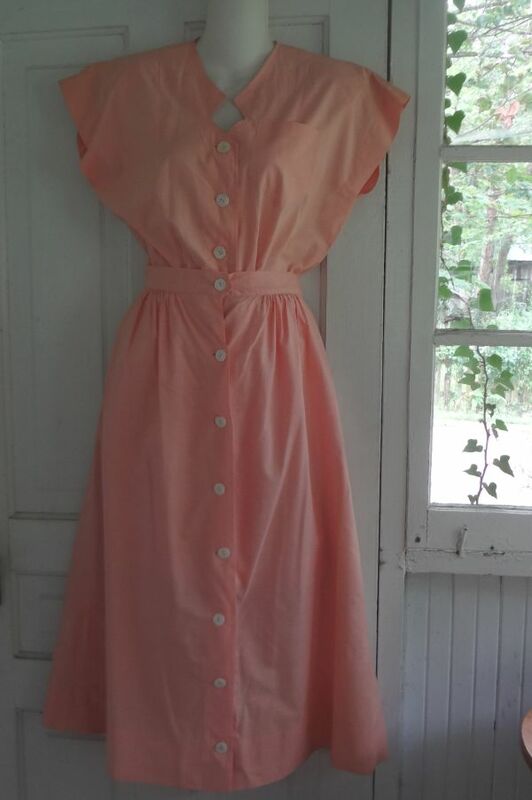 I notice that at the waistline there are no buttons – that would suggest to me a playsuit with matching skirt as I doubt a gym suit would need that touch? That’s a good point, Jennifer. I’m a bit puzzled about the tabs at the sides as well. Perhaps there was a matching belt?? If our awful navy blue gymsuits with elastic bloomer legs had looked like this, I wouldn’t have minded gym class 5 days a week nearly so much. 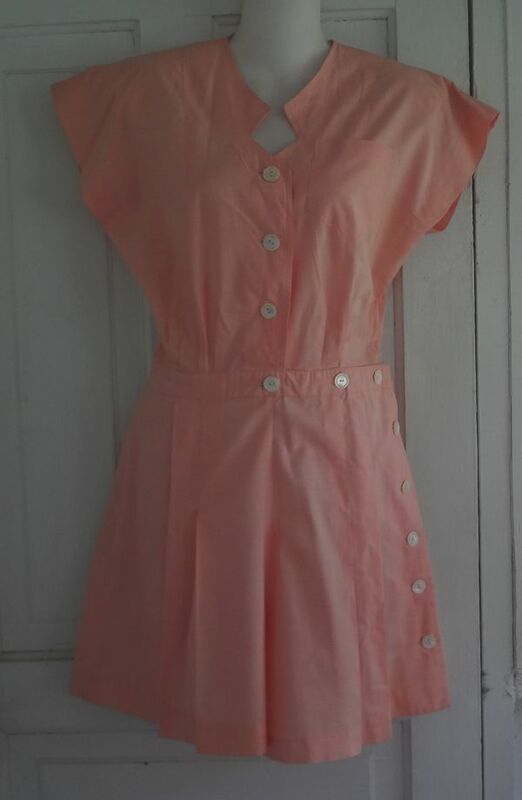 It could be a play suit, but it’s adorable either way. Hollis, it’s almost like they wanted us to dislike PE! !